Researchers from the Cardiff School of Geography and Planning in the United Kingdom used Tobii Pro Glasses 2 to understand the occurrence of compulsive behavior among people with Tourette syndrome. This social scientific study attempts to understand how and why compulsive behavior starts, as people with Tourette’s cannot articulate a reason for this behavior other than diminishing uncomfortable sensations produced by the disorder. At Cardiff, they are investigating the bodily relations with the affective materiality with which these acts are performed. The outcomes help expand human geographical theory on the relation between human sensibilities with non-human materiality through the concept of compulsivity and help reimagine the nature of Tourette syndrome and related conditions. The empirical data derived from working with Pro Glasses 2 combines qualitative data gathered with semi-structured in-depth interviews and observations. The studies were conducted with 15 participants diagnosed with Tourette syndrome, often with comorbid OCD and ADHD. 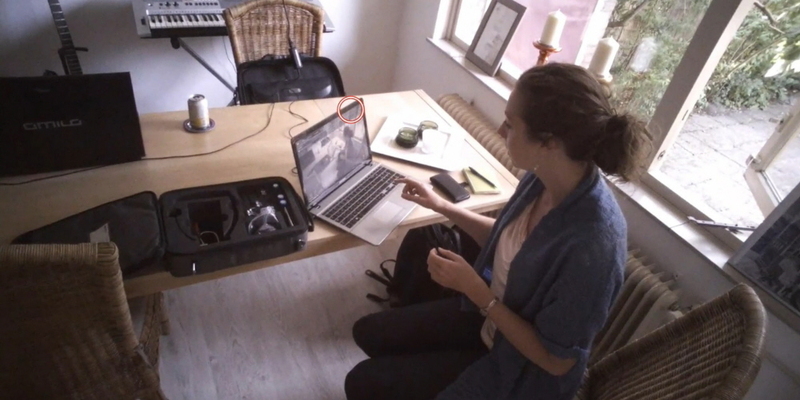 The eye tracking data was collected in the participant's home and/or public places in various cities in the Netherlands. After giving consent, they were asked to do an activity that would evoke many compulsive behaviors, without it impeding on their wellbeing. For instance, doing dishes, cleaning the living room, or driving; activities that allowed demonstrating rituals and visualising the complex entanglements with objects and other material presences, thereby showing the participant's everyday realities. First the participants completed a 10-minute activity to get used to wearing Pro Glasses 2 and then began the actual test. After each session, the recordings were discussed with the participant in a recorded interview. With Pro Glasses 2, it has become possible to demonstrate the involvement of different senses with particular kinds of compulsive acts that are performed to satisfy tensions in, on, or outside the body (see table below). Hence, the use of wearable eye tracking questions the taken-for-granted notions of the role different senses play in the performance of compulsive behavior. My eye tracking data, obtained with Tobii Pro Glasses 2, is incredibly rich and truly shows the complexity involved in the compulsive interactions of people with Tourette syndrome and their sociomaterial environments. In addition to general knowledge about compulsive behaviors, eye tracking helps in understanding how and when compulsive behaviors become part of intentional practices, as well as how and when objects and (details of) other materialities become enrolled. As these behaviors are part of the daily reality of many people with Tourette's, the results of this study help shape societal and academic awareness of the disorder and may aid development of behavioral therapies.